Have you ever felt like you wanted to develop a solution that could change the world or at the very least make your clients extremely happy? Perhaps your ideas could revolutionize the industry. At CDN Software Solutions, we make it our mission to give wings to all new ideas with our innovative solutions and play our little role in making this world a better place. 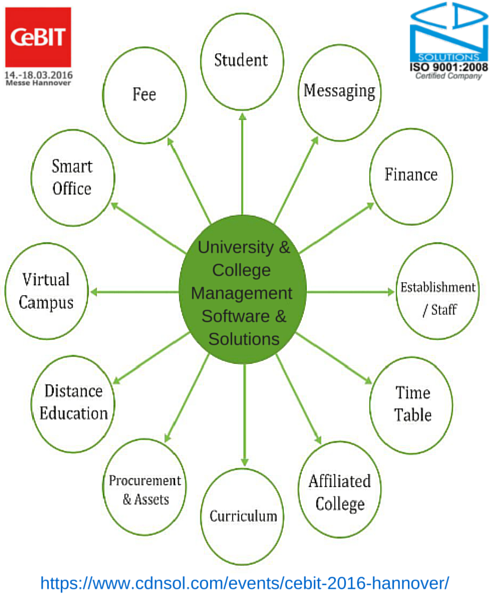 Education in today’s world, administration & management of organizations, particularly universities and collage management, has become a tedious and complex task. It requires systematic approach, careful planning and accurate control of all processes to attract the best students, produce best results and project the best image. At CDN Software Solutions, we work on innovative solutions rather than just developed the solutions using traditional methodologies. We always welcome new ideas or latest technologies in our organization and that’s why we are exhibiting for the 5th consecutive times in CeBIT Hannover 2016. CeBIT Hannover is the platform to showcase all your smart and innovative work and also find connect with Germany market. So reserve your CeBIT free guest pass from us and meet CDN Software Solutions at CeBIT Hannover 2016 at Hall 2 Stand no. C 36.